A couple of weeks ago, Teena was in Winnipeg and came home with lots of new beers for me to try. Among them were two from Half Pint Brewery, 6 of their Little Scrapper IPA and 2 Stir Stick Stouts. She is so good to me! 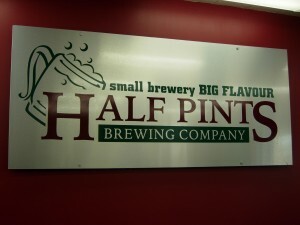 I could not find too much information on Half Pint Brewery except that they opened in August of 2006 and have had to expand their capacity twice in the past four years in order to keep up with demand. Located in downtown Winnipeg, it claims to be Manitoba's only remaining Manitoban-owned brewery. Fort Garry is brewed in Winnipeg but is co-owned by Russell Brewing in BC. In October of this year, Half Pints installed a pair of 40-barrel tanks, which will increase its capacity by nearly 50%. The new tanks boost the brewery's capacity to 8,000 hectolitres a year, or nearly 100,000 two-fours. That's up from 1,500 hectolitres or about 18,000 two-fours when Half Pints started up nearly four years ago. The website lists all the places that serve their beer on tap. Quite a few places in Manitoba, Alberta and Saskatchewan carry Half Pints on Tap. And the beer? I decided to start with the Little Scrapper IPA as I had more of them to hopefully enjoy. It pours a slightly dark amber in colour with a nice head that does last. This ale is cloudy which suggests it is unfiltered. The website does say it is, "unfiltered, unpasteurized and unadulterated." There is that familiar aroma of hops when I had a smell. When I sip, immediately the hops are in the foreground of the taste. Surprisingly the hops diminish in the finish. Usually when hops are at the front of the taste, they last all the way through the finish but not here. Instead the hops level off and there is more malt in the finish than hops. It is a very nice, enjoyable IPA. Not sensational but very nice. Sure won't be hard making the other 5 bottles disappear. It's now a day later and I am trying the Stir Stick Stout. It comes in a regular size 341 ML bottle but is unusual in that the bottle is not only capped, but the bottom of the cap is also sealed in wax. The website does not say why but it definitely forces the drinker to use a glass, which you should for a stout or porter ... really any beer. The beer is unfiltered, dark brown, almost black in colour and very lively when poured. It instantly had a huge head, which took a little while to settle before topping up for the picture. I could smell the roasted malt and some coffee in the aroma. No surprise as they use an Ethiopian coffee in their brew. The coffee is the first thing tasted when sipped and last through to the finish. There is a creaminess to this stout which I enjoyed. Many other brewers I find can't get this creaminess in their stouts. I enjoy a bitter beer but found the coffee adds a harshness to the beer which takes away from some of the total enjoyment. This is a beer I could have only one or two of before switching to something else. A good stout, but not a great stout. Over all I would say that Half Pints Brewery makes very decent beer. I would not hesitate to have any other of their brews. In fact, Bar Volo in Toronto carries Half Pints on Tap. I'll be trying one next time I'm there. Thanks again, Teena, for picking these up for me!